Neng Yang is a first-generation Hmong refugee who has fused the classic art of American quilt making with the traditional embroidery she learned in Laos. Neng handmakes each piece with intricate detail and designs that honor her Hmong culture. Her beautiful work would be a special keepsake in any home. I am a first generation Hmong refugee from Laos and Thailand. I have lived in the United States now for 39 years; 30 of those years in MN. I grew up in Laos doing traditional Hmong needlework (cross stitching and appliques) as part of my traditional clothing to wear on a daily and during festivals. As I acclimated to my new life in the USA, I have started to apply my skills towards quilt designs and sharing my art with the craft communities I’ve found in MN. My Hmong needlework is an essential part of my cultural identity and connects me with the country I grew up in. It also allows me to share my Hmong culture with the larger community here in the USA thus fueling my passion for my artwork. I started creating my own designs into quilts, table runners, and pillows which has allowed me to be more creative and blend the two cultures (Hmong and American) of which I am now a part of. My absolute favorite from over the years of selling and making my craft are my quilts. I started venturing into American quilt making back in the 1986 and only started incorporating my Hmong designs in 2005; making it the first Hmong incorporated designed quilts that I knew of. My Hmong quilts are my pride and the peak of my needlework thus far. It makes me proud to bridge my Hmong art skills with an American quilt tradition and share it with the art community that I have found here. Doubling down on the notion that this is truly a Hmong-American art form that speaks to the connection between the two cultures that I now live in, am a part of, and is who I am. I am passionate about the meaning behind my Hmong artwork and being able to showcase this in such a rooted American quilt-making tradition. Check out more of Neng's work online, and be sure to stop by her booth at the Minneapolis Gift & Art Expo, November 2-4, 2018 at the Minneapolis Convention Center! Inspired by her twin boys and her family history of master jewelers, Myriam Kinde began crafting colorful beaded jewelry. She started Flaranto Jewelry in 2017 after ten years of experience creating one-of-a-kind pieces and learning everything she could about the art of jewelry making. We love her detailed work, and the joy she finds in the selection of her stones and beads is apparent in every adornment she makes. My name is Myriam Kinde. I'm a handmade Jewelry Designer and maker. I'll be presenting handmade bracelets with Christmas beads. Because I design and make my own items, I can say they're all special items. What do your customers love the most about your products? The uniqueness and my art of matching the colors.I also try to use beads that are of uncommon shapes or tell a particular story. I have loved decorating since I was little. My passion for designing jewelry started after I gave birth to my twin boys. No. I have a full-time job as a Systems Analyst for a bank. What is your favorite item that you sell? I got the inspiration from my mother. I'll also admit that both my grandfather and my uncle were goldsmiths, so I can say it runs in the family. What do you think sets your design apart from others? The creativity in my design. Plus my aim to always use high quality materials in my design. Flaranto is an anagram of my twin boys' names. After a very complicated pregnancy, I was with memory loss issues (like putting car keys in the microwave lol) to which my doctor suggested some craft activities might help. My mom who was helping me with the young kids then, gave me the idea of trying jewelry. Check out more of Myriam's work online, and be sure to stop by her booth at the Minneapolis Gift & Art Expo, November 2-4, 2018 at the Minneapolis Convention Center! These beautiful cards are not only a special way to send a message, they are works of art perfect for framing. Anh and Aaron Furuseth are the owners of Iconic Quilling, where they create stunning keepsakes using the intricate technique of paper quilling. After discovering the art form on a trip to visit Anh's hometown in Vietnam, the couple started their business quilling iconic images inspired by their home in Minnesota. Anh works at the business full time and has for the last 5 years. She is the driving creative force behind the cards and everything starts out in her head and then is a drawing before it is quilled. Aaron still maintains a 9-5 job as a distribution manager. The goal for us is to make the business full time for both of us! This would allow us to go to art shows that are further away and bring out products (and the smiles that they bring) to a wider audience! We got our start buy finding some quilled greeting cards in a book store in Ho Chi Minh City, Vietnam. Anh is originally from there and when we had just met each other, we traveled there together to meet her family and experience her home town. Initially, we were trying to import the cards and run the business that way, but it quickly became apparent that it would not work. The cards were 6"x6" which made them difficult to mail and display for retail and also tough to find frames for. Additionally, the art work was aimed more at the Asian market. Anh sat down and started designing cards based on our experience camping and hiking and fishing in Minnesota. We changed the size to 5"x7" so that the cards could be used as works of art to hang on the wall and not just standard greeting cards to be thrown away. We have actually named the business 3 different times! This most recent one and the one that we will most likely stick with as long as we have it, reflects the iconic nature of our images. Often, the most difficult part of quilling is to convey the sense of an animal or a flower using the medium of rolled paper. Since we have a limit on how many strips we can use (in most cases, 50 strips) we need to be creative in how we present the images. It is both difficult and rewarding and the name Iconic Quilling is simple to understand and really reflects the design choices we make when creating our images. Our favorite thing about exhibiting at craft shows is the smiles that we see when people realize what they are looking at! Quilling is not a very well-known art form in the states. Those that do know it often had a grandma or aunt that used to do it and are even more excited when they see our work. We always wanted a business that made people smile and we really couldn't have done better than picking quilling to be that business. It even makes us happy to look at the colorful and intricate images! Sharing our work with people and seeing how it connects with them is very rewarding. We create cards for Mother’s Day, Father’s Day, Valentine’s Day, Christmas and New Years. Christmas is by far our biggest seller. We have a ton of new designs coming out this year for the holidays. We are very excited to showcase them and give people not only the opportunity to send a unique card to someone but to give them a gift that can help decorate their home for the holidays! Check out more of Anh and Aaron's work online, and be sure to stop by their booth at the Minneapolis Gift & Art Expo, November 2-4, 2018 at the Minneapolis Convention Center! Denise Johnson is an artist with a tremendous eye and respect for her medium of choice. She turns trash into treasure by using recycled scraps to make her dynamic pieces, and she allows the unruly alcohol inks to assist in the composition; they blend to create the movement that each work possesses. "I'm Denise Johnson. I've been doing artsy things all my life. My earliest crafty memory is taking a wooden cutout of a chicken and gluing dried beans to it. Thankfully, I've picked up a few more creative skills along the way. Chickens are still with me, beans, not so much.. I have been painting with alcohol inks almost 7 years now. It is a relatively new medium. I may be the only person on earth that paints on a recycled material called Corian. Corian is usually used for high end countertops. My husband purchases scraps that would otherwise be headed for a landfill and then garage crafts beautiful and functional Corian cutting boards. I scoop up his scraps (sometimes I help myself to non-scraps, don't tell him) and transform them into beautiful works of art. These alcohol-based inks are a very spontaneous, fast moving medium with a mind of their own. I find that if I use my intuition and follow the inks where they lead, my paintings take on a life of their own. When you look at my paintings, I want to grab your heart; draw you in and connect you to the breathtaking colors, textures and movement of the inks. As one lady commented at a recent show "Your work is so uplifting!" and like the Hokey Pokey, that's what it's all about! I hear my soul knocking. I answer with my art." Check out more of Denise's work online, and be sure to stop by her booth at the Minneapolis Gift & Art Expo, November 2-4, 2018 at the Minneapolis Convention Center! Croix Valley Foods is your one-stop-shop for amazing flavors, fun recipes, and all natural products. Damon and Lu Holter are a competitive cooking duo whose recipes have won them countless awards and features. 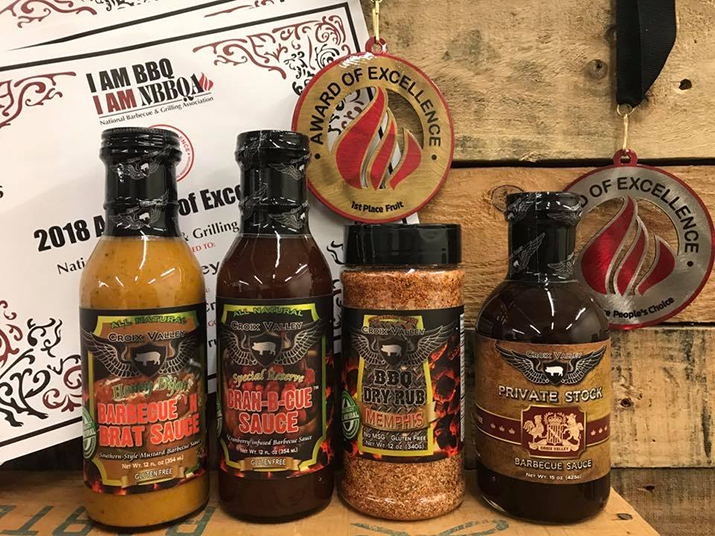 Their dry rubs, sauces, and marinades are the perfect gifts for the avid grill master and foodie in your life! We are husband and wife team, Damon and Lu Holter. 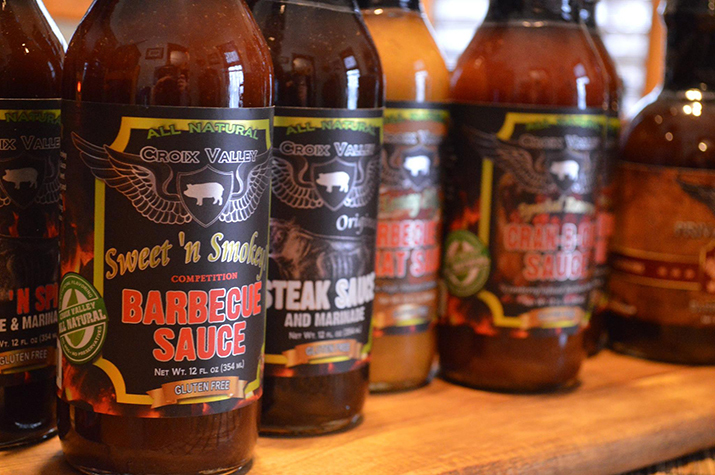 We are Croix Valley Foods, producers of the Croix Valley line of sauces, dry rubs, Bloody Mary seasonings, and marinades. We are also a competition cooking team that travels all over the country and have been featured on Food Network, Outside Television, and lots of local Twin Cities stations! Our customers love our unique flavors, fun recipes, and that all of our products are all natural and gluten free. Customers also enjoy our videos, Facebook posts (including lots of Facebook live videos), and our website full of fun recipes, tips, and tricks. We love vending at craft shows because it gives us the opportunity to share our products and passion for cooking with people in a fun, high energy way! It’s fun to talk to people about the uses of the products as they are trying them. We’ve gotten our most loyal customers from craft shows. Yes! This is a full time business for both myself and my husband. We are passionate about our products and love what we do! We have our own production facility in River Falls, WI and handcraft all of our products in small batches insuring the quality and consistency. We love traveling and competing in food sport, steak competitions, and BBQ competitions (using our products) across the country. 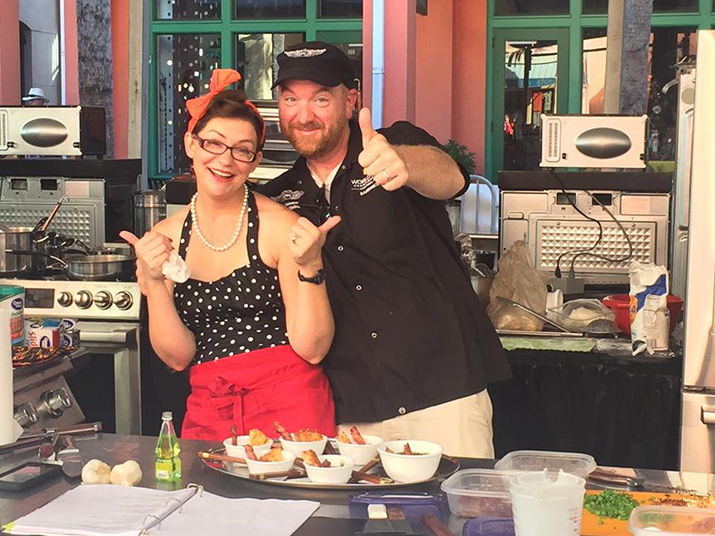 My favorite moment was having both my husband and I place in the top ten at the World Food Championships in 2014 and again in 2017. We also travel annually to the American Royal World Series of Barbecue in Kansas City and have done very well there, with our best being a 1st place call in sausage! Check out more of Croix Valley Food's products online, and be sure to stop by their booth at the Minneapolis Gift & Art Expo, November 2-4, 2018 at the Minneapolis Convention Center!